Every family photographer in Chatsworth wants to capture that perfect image. That image that will be placed in an album or hung on the wall. We have the experience of making images with feelings. We like to say we take family pictures in Chatsworth to the next level. This specific picture was actually captured during a senior session with the subjects sister. Nothing was posed. Nothing was added or subtracted. During the session the exhausted brother took his hat off, and laid down. The family dog jumped up beside him. 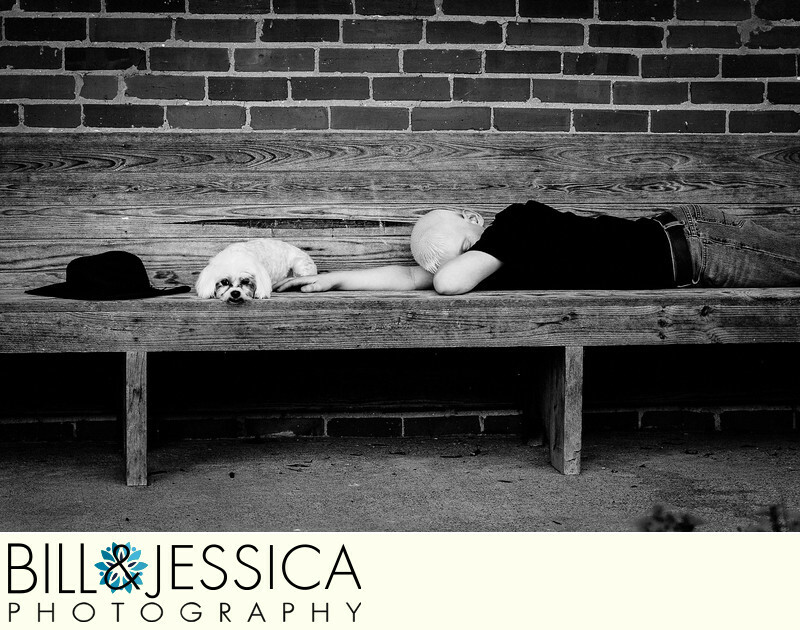 It was in that moment that we noticed the resting boy with his dog and hat, on an old wooden bench by a plain brick wall. This has got to be one of our favorite images. The black and white just makes it standout and tells the story in a way that a color image would not. Just as this image shows, you don't have to get complex to capture images with feelings. Most of the time when people contact us looking for a family photographer, the question of where always comes up. They know they want "outside" family pictures, but don't know the best place. We suggest places close to their home. Where they grew up and raised the family. Maybe a place that has special meaning to them. Those my friends, are images with meaning and feelings. Location: 201 E Market St, Chatsworth, GA 30705. Keywords: Seniors (333). 1/125; f/4.5; ISO 200; 70.0 mm.